Card Text: Riot (This creature enters the battlefield with your choice of a +1/+1 counter or haste.) 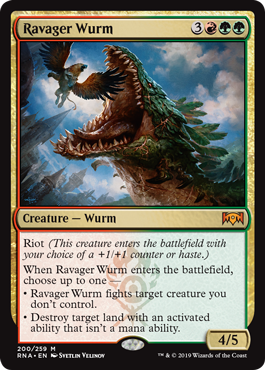 When Ravager Wurm enters the battlefield, choose up to one — • Ravager Wurm fights target creature you don't control. • Destroy target land with an activated ability that isn't a mana ability.